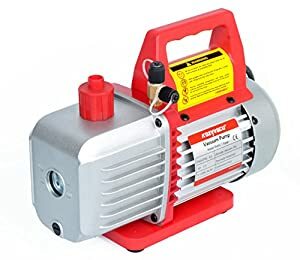 10 Best HVAC Vacuum Pump Reviews: Buyer's Guide in 2019! 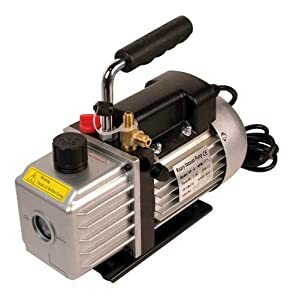 HVAC pumps are portable pumps used by technicians to check the integrity of a vacuum refrigeration system found in air conditioners, refrigerators, and other cooling systems. One of the most important issues when dealing with installation, service, and repair of various vacuum refrigeration systems is the integrity of your HVAC pump. A poorly maintained or low-quality pump will not reach the levels of the draw that are required to clean out a contaminated system totally. This is why we decided to review the current HVAC pump status and create a comprehensive guide for consumers of all levels of experience. In this guide, we present you with the top 12 HVAC pumps that met our standard KPI’s which are HP, CFM, oil capacity, weight, and dimensions. (After all, you will be carrying this motor with you, and maybe climbing a lot of stairs on the way. Bonus: I added a review of the company behind the pump, so you can decide whether you want to invest in a brand or a generic. The Robinair 15500 is a two-stage pump that provides 1/3HP which is plenty of power for most jobs. 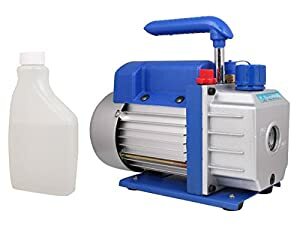 This pump comes with a smaller oil reservoir, while the oil fill port is placed conveniently so that filling can be made from the front or either side of the pump. There is a sight glass so you can see when the oil has been added. The pump body is made of cast aluminum, so you get a strong yet lightweight unit to carry. This unit works with 115 volts, and it comes with ½” ACME and ¼” MFL intake fitting. We found this unit to be easy to carry, silent and efficient. 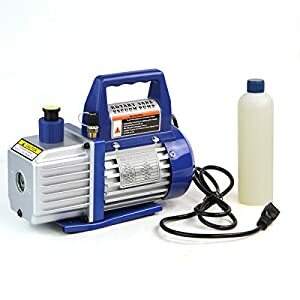 Overall a good experience and this is a very easy pump to maintain and clean. The price is also right, so you good value for money. This is no generic brand; this company was bought out by Bosch back in 2012 and is now part of the Bosch family. This means you get the best of German engineering and service. In fact, when looking at the price and the pedigree, there is no wonder why I opened up this guide with this product. 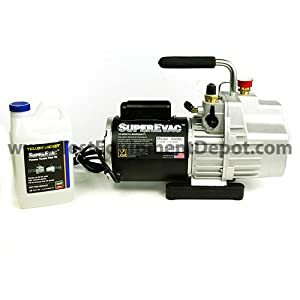 The Yellow Jacket SuperEvac™ 93560 is a powerful pump, with ½ HP of power. This two-stage rotary vane oil-sealed pump comes with a wide-mouth oil reservoir port for easier filling and has an oil sight glass for easy view of the oil level, and it also comes with a built-in vacuum indicator gauge. This model has a cast aluminum housing with a heavy-duty steel handle for balanced and easier carrying. What is even better is that the SuperEvac™ 93560 comes with an isolation valve for oil changes, which means you can change oil without losing vacuum in the system. This unit comes with a ¼” and a 3/8” Male flare intake and works with 115 Volt – 60 cycle. Yellow Jacket is a 60-year-old US company and as such produces US quality products that are undoubtedly at the top of their category in the market. The price also reflects this, also be prepared to pay for the level of quality and performance that these products provide. This is the Zeny pump comes in two similar versions, the 3.5CFM, and the 4CFM version. The structural dimensions are similar, so there is not much to consider other than how much power you want to carry around with you. 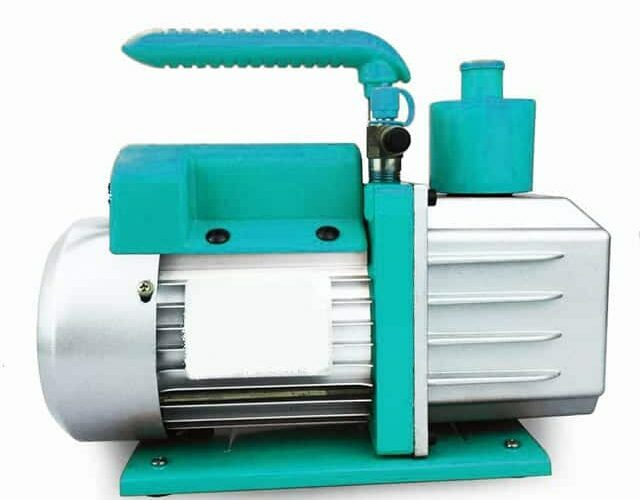 The pump is encased in an aluminum die-cast housing and comes with an oil sight glass to check oil status as well an internal high volume cooling fan for better temperature control. The housing comes with a non-slip rubber handle for easier carrying. This model comes with 2 ½” Gauges with a protective sleeve and a 1/4″ (male) to 1/2″ (female) ACME adapter. It also comes with an air condition system diagnostic and service gauge set and is powered by 100V 60Hz. Zeny is the brand name for Appletree international Corp. which is a Japanese company that has been around since 2010; this is a subsidiary of Green Innovations Holdings Co., Ltd which is another Japanese company that has been around since 1972. This company specializes in buying generic products and branding them. So, the Zeny HVAC is extremely cheap since it is most probably fabricated somewhere in Asia. This HVAC pump gives you extremely good ROI since its price is so low. The Kozyvacu TA350 is a single stage rotary pump best suited for handling refrigeration systems. This model comes with a die-cast aluminum housing and has a built-in rubberized handle for easy and safe grip handling. The motor is thermally protected making it durable for long time duty, and the oil fill port is accessible from the front or either side. The oil drain port is under the reservoir. This model has a sight glass for oil level status. 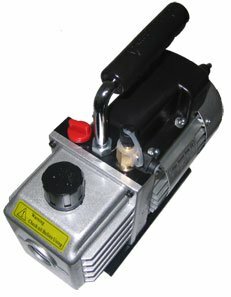 The pump is powered by a 120V 60HZ source, and it comes with a ¼” flare female x ½” Acme male. Kozyvacu® is a registered brand of Kozyard LLC. This company operates a manufacturing site in China and has been around since 2002. 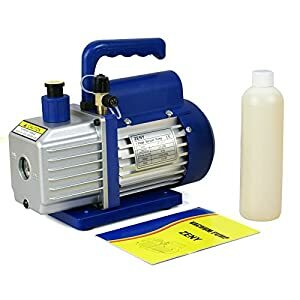 This particular kit is extremely good value for money since you get more than just a pump. 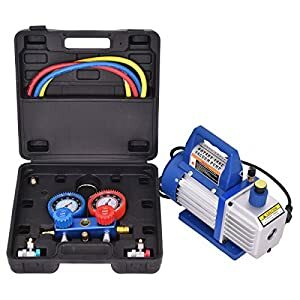 You get a complete set for AUTO AC refrigerant recharging, include their pressure gauge set, a 1/4 Pressure Scale: 0~400psi, 0~140psi, 3 x 4’ hoses in Red: 1/4”-1/4” Yellow:1/4”-1/4” and Blue:1/4”-1/4” and a quick coupler adapter. Overall, a good deal. The TMS 3 CFM single stage rotary pump provides a very quiet and stable supply of power. This model has the industrial standard internal cooling fan keeping the pump cool during extended usages. It comes with an oil window that gives you easy to see oil levels and oil quality information. The pump is encased in a die-cast aluminum casing and comes with a rubberized handle for easier carrying. This model uses a 110V/60HZ power source and comes with a ¼” inlet port. TMS is an Illinois based manufacturer that fabricates, services and sells products online. This particular product is extremely good value for money, especially when you factor in that it was made in the USA. The price is right, and the copay provides good service. The Kozyvacu® TA450 is their 1/3 HP single stage rotary pump best suited for handling refrigeration systems. This model comes with a die-cast aluminum housing and has a built-in rubberized handle for easy and safe grip handling. This model is 2lbs heavier than their 1/4HP model, so if you don’t mind that extra weight, you might consider buying a more powerful unit. The pump is powered by a 120V 60HZ source, and it comes with a ¼” flare female x ½” Acme male. 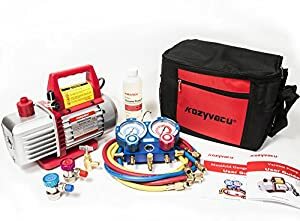 Kozyvacu® is a registered brand of Kozyard LLC. This company operates a manufacturing site in China and has been around since 2002. This is a stand-alone pump, and the price is so low you blink twice. However, since it is made in China, you wouldn’t expect more. All in all a confident pump that provides good service and very handy to own. The FJC 6912 is a single stage 1/3 HP HVAC pump used for home and commercial applications. This model was developed for automotive R12. R22 and R134a operations, and comes with both fittings, the ¼” SAE and a ½” Acme. This model is powered by 115V, 60 HZ, and the housing is made of standard die-cast aluminum. And has a rubberized handle for easier carrying. FJC Air Conditioning Products is a North Carolina based manufacturing company that was founded in 2003 and has been providing some exceptional quality products on the US market. The price is right, the product is right, and they are supported by many accessories and exceptional customer service. You will never go wrong when investing in such a product. The Xtremepower US is a single stage HVAC pump that provides 1.3 HP using a 110V 60Hz power source and provides 4CFM. This model is encased in a die-cast aluminum casing and has an internal cooling fan. This model is known to pull over 28” of coolant from some systems and weighs only 13lbs, which makes it a contender for the lightweight class. XrtremepowerUS is an online company that hides its identity, so we don’t know where or when their products are manufactured. All we do know is that it is good value for money. However, customer service, spare parts, etc. Well, that’s up to you to decide. We personally prefer transparency, brands that we can find out who sits on the board and where their service points are, and most of all, where they are made. The bottom line of the bottom line, this came in since we tested it and it works, and the price is right. The Robinair 15310 VacuMaster® Single Stage Pump provides ¼ HP giving 3CFM. It’s extremely lightweight, coming in at 8.2Kgs, and comes with an intake screen that prevents contaminants from entering the pumping chamber, and an internal exhaust filter that separates the exhaust flow from the oil vapor. 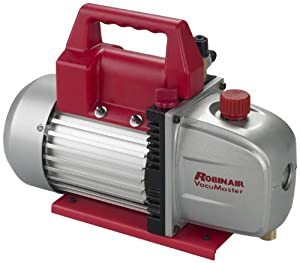 This model comes in a die-cast aluminum housing with rotary vanes to keep the pump weight low and has a rubberized carrying handle. This model is powered by 110V at 60hz and comes with the standard ¼” flare and ½” ACME intake ports. As explained above, this is a Bosch owned company now, so you know who is behind this machine. Since it is a Bosch backed model, and since the price is just right, we recommend this to anyone seeking a reliable and effective HVAC machine at a comfortable and budget-friendly price. The Goplus 4CFM 1/3HP HVAC pump is a 4CFM pump that comes with a gas inlet that prevents oil anti-flow during operation. There is a small oil glass viewing pane to check the oil level. The unit is powered by a 110V 60Hz power source and comes with a ¼” flare inlet port. The body is die-cast aluminum and has a comfortable rubberized handle for easy handling. This model also comes with its own carry case and micron gauges. This is another mystery company where we couldn’t find much about the company or the spare parts situation. Customer service is important too. The price is average, and the lack of transparency made us think twice before adding this kit into the list. It is good value for money, and the product works. However, you need to think twice when dealing with hidden companies. This generic model provides a small 1/6HP but delivers a lot, with its 2.5CFM. Its weight is also lightweight, so it makes a perfect travel companion for visiting clients on site. This model comes with a die-cast aluminum housing and rubberized handle for easy carrying and has an easy access port for oil as well as a thermal overload protection valve. This is another generic brand, and the pump is small. It provides adequate performance for the price and is seen around many sites. The only reason its included is its weight to power ratio, and the fact that it is really easy to use. The Smartxchpoices pump kit is a Zeny VP125 motor that provides 3.5CFM. 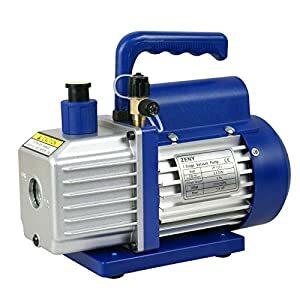 The pump is encased in an aluminum die-cast housing and comes with an oil sight glass to check oil status as well an internal high volume cooling fan for better temperature control. The housing comes with a non-slip rubber handle for easier carrying. As mentioned above, Zeny is the brand name for Appletree international Corp. which is a Japanese company that has been around since 2010; this is a subsidiary of Green Innovations Holdings Co., Ltd which is another Japanese company that has been around since 1972. This is a really good value for money kit, and I don’t close this review with this product for no reason Its worth the investment and will provide you with a lot of smiles. HVAC pumps are primarily used by technicians that are called in to install or service and repair refrigerant cooling systems. An HVAC pump will pull out the coolant from the system; it will then be used to purge the system from contaminants by using liquid nitrogen. Where there are leaks, it will be used to detect the leaks locations. HVAC pumps come in various sizes and require additional equipment to perform the necessary jobs. Next step is to attach the hoses of your manifold gauge to the valves. Note the colors; the blue hose connects to your low-side core removal tool while the red hose connects to the high-side core removal tool. Always check your pumps oil levels before the operation. This is done by checking the oil sight glass. If there is any doubt, fill the pump will oil. As consideration for correct pump maintenance, always make it a habit to clean out your pump after use, and bring it empty on site. Then fill it on site. This sometimes means a bit more work, but it makes sure that you always start a job with fresh oil. Always put the HVAC pump on a straight surface. Now you can turn the HVAC pump on. Dependent on the type of gauge you use; an electronic gauge will show the microns lowering. It’s always best to follow the manufacturer specs for determining the right level, however, in most cases, it will be around 500 microns. Once you reach that level, you turn off the pump. It’s time to check for leaks; if you have a leak, the pressure level will continue to go up until it reaches atmospheric levels of 760,000, this is usually a sign that you have a leak. Now it’s time to disconnect all three manifold gauge hoses and replace the service valve caps. Remember, you must have a good HVAC pump to perform any good evacuations before you recharge the system you are servicing. In most cases a one stage pump is enough, however, for the impatient technician, a two-stage pump will reach that 500-micron level quicker. Take into mind the different sizes and weights as well as costs of pumps. Also, take note that the larger the refrigeration system being checked, the bigger an HVAC pump you want, otherwise you will be waiting around for a long time to reach that 500-micron spot. The CFM is what will give you the speed, HP is over-rated since it does not mean speed, only power. Modern technologies provide much more CFM to lower HP, so always check the CFM to HP ratio.